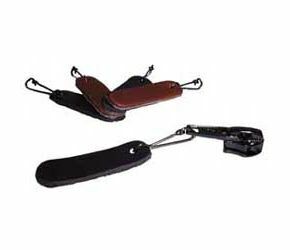 These leather tab zip pullers will make life so much easier, they simply clip onto your zip to make fastening easier. Available in packs of five, 3 black and 2 brown. Very simple tags that are great on coats and hoodies but not been able to use on trouser zips as they dangle! My husband has neuropathy and Parkinson's, and had difficulty getting hold of small items. I have had trousers altered to replace buttons with velcro, and fit these to the zip pull. It works well.